Thomas Birch was probably the first academic painter in America to paint winter views, compositions which were to influence George Durrie whose work was popularised through the lithographs of Currier & Ives. Thomas Doughty, also a Philadelphia artist, painted Winter Landscape, Museum of Fine Arts, Boston, in 1830 and Régis François Gignoux would later be known for his paintings of the snow-covered landscape. Among the Hudson River artists, Jasper F. Cropsey painted a number of winter scenes, often as a set of The Four Seasons; Frederic E. Church painted the winter landscape near his home, Olana; and Rémy François Mignot, trained in Holland, portrayed the winter landscape. Winter scenes, however, were a minor subject among American 19th-century painters until the American Impressionists, working near the end of the century, delighted in the effervescent effects of light upon the snow. Birch's paintings come out of the Northern European landscapes tradition in which the winter was considered "the Dutch 17th-century landscape par excellence." Birch's father owned a number of Dutch paintings, or copies, in his collection, including Jacob van Ruisdael's The Stump and Jan van Goyen's Winter Scene, which shows figures skating. Birch's Philadelphia Winter Landscape shares with the Dutch tradition the low horizon in which the sky, against which leafless trees are silhouetted, is at least half of the composition. His figures, endowed with the subdued gaiety of Northern painting, remain an incidental, although important, part of the landscape. Birch's painting, artless in its portrayal of winter activities, is far more ingenious than it seems. Two figures, proceeded by a horse-drawn sleigh -a hallmark motif of Birch's winter scenes-lead us down a snow- covered road. A stream, transformed into a sheet of ice, emerging from the centre of the composition moves in a counter-curve to the lower right of the painting. The intersecting road and stream create an almost perfect oval which encloses a large farmhouse. In the foreground, where the road and stream cross, a figure gazes at the skaters below. One is putting on his skates, the other is gesturing along the length of the stream leading us into the landscape. 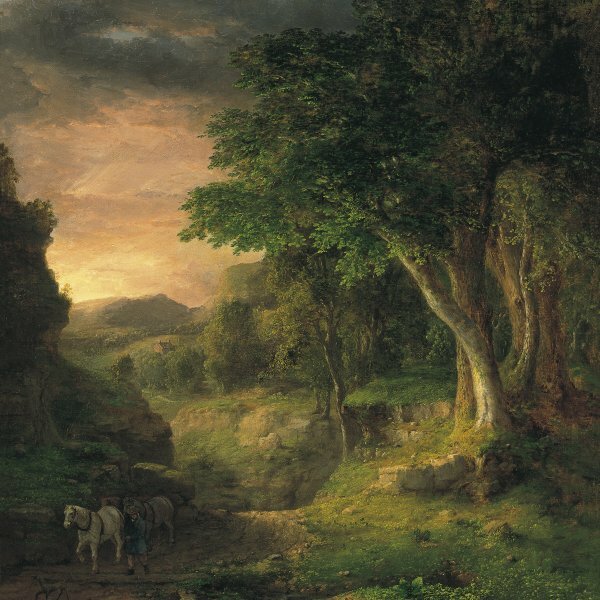 The same composition, in which road and stream intersect, was used in Sleigh Ride on a Gray Day, 1832 (Private Collection), which is Birch's earliest extant winter scene that can be firmly dated. 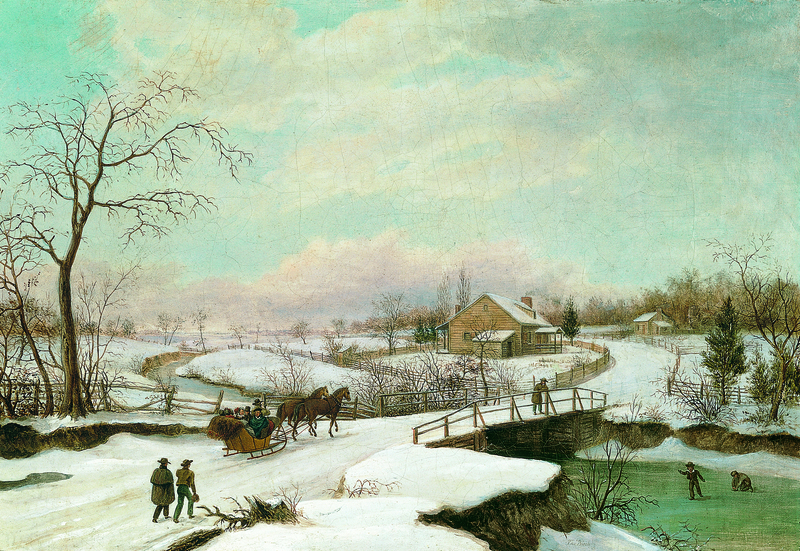 Although in this painting the bridge is stone, the sleigh comes towards the viewer, the farmhouses are placed to the left of the road, and no skaters are portrayed, the similarities of the two canvases are far greater than the differences. In Skating, c. 1830-1840, Boston, Museum of fine Arts, which closely relates to Philadelphia Winter Landscape, the gesturing and bending skating figures are also seen. Birch's known paintings of winter scenes are dated between the years 1832 to 1842; exhibition records for the Pennsylvania Academy of the Fine Arts and the Artists' Fund Society show that Birch exhibited winter landscapes almost every year from 1811-1815 and 1834-1844. Winter subjects then ceased until a final painting, Winter Scene, which was exhibited in 1851, the year of his death. Although a late date of 1847 has been suggested for the Carmen Thyssen-Bornemisza painting, it is more likely that it was painted in the 1830s or early 1840s.